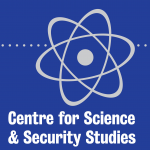 The Centre for Science and Security Studies (CSSS) is a multi-disciplinary research and teaching group that brings together scientific experts with specialists in politics, international relations and history. CSSS forms part of the School of Security Studies at King’s and draws on experts from the Department of War Studies and the Department of Defence Studies. Members of the Centre conduct scholarly and policy-relevant research on weapons proliferation, non-proliferation, verification and disarmament, nuclear security, space security and mass effect terrorism including the CBRN (chemical, biological, radiological and nuclear) dimension. CSSS also hosts Project Alpha, which takes an academically rigorous but policy-oriented approach to studying the problem of nuclear proliferation, using a wide range of open source tools and techniques. In addition to academic staff, CSSS host masters and postgraduate research students, as well as visiting fellows and associates drawn from the academic, government and business sectors. Three Masters Programmes are run within CSSS, an MA in Science and Security (launched 2005), an MA in Non-Proliferation and International Security. (launched 2012) and an MA in Arms Control and International Security (launched 2016). A significant emphasis is also placed on engagement with industry, government and international organisations, and the wider dissemination of research findings through interaction with the media. wyn.bowen@kcl.ac.uk Wyn Bowen is Head of School for the School of Security Studies at King’s College London, comprising the Defence Studies Department (DSD) and the Department of War Studies. From April 2014 to August 2016, he was Head of Department/Dean of Academic Studies of the Defence Studies Department, based at the Joint Services Command and Staff College (JSCSC) at the Defence Academy of the UK. Prior to April 2014, he was Professor of Non-Proliferation and International Security in the Department of War Studies and Director of CSSS since September 2007.
kieran.bird@kcl.ac.uk Kieran joined the Project Alpha team in July 2018 as Business & Finance Manager. He previously worked in office, procurement, financial & grants management in the higher education sector at Imperial College London. He has spent the past 16 years at Schistosomiasis Control Initiative, an international non-profit organisation focusing on the elimination of neglected tropical diseases, predominantly in sub Saharan Africa. He is experienced in setting up new offices, recruiting and setting up systems, and policies and procedures. Kieran is familiar with working in complex donor environments. This includes managing budgets, and reporting and compliance requirements for a variety of international donors such as the BMGF, USAID & DFID UK. After studying at Middlesex and Imperial College London, Kieran spent 3 years in TEFL in Southeast Asia. Dr Jonathan Brewer lives in New York. He is a Visiting Professor at the Department of War Studies, an Adjunct Senior Fellow at the Center for New American Security, Washington DC, and an Associate Fellow at the Royal United Service’s Institute, London. James Cameron is a postdoctoral research associate in the Centre for Science and Security Studies and the Centre for Grand Strategy. His research sheds new light on the nuclear history of the Cold War and explores its implications for current policy. He is the author of The Double Game: The Demise of America’s First Missile Defense System and the Rise of Strategic Arms Limitation (Oxford University Press, 2017). James has previously held fellowships at Stanford and Yale, and has taught at Fundação Getulio Vargas in São Paulo, Brazil. He holds a BA and PhD from the University of Cambridge and an MPhil in Russian and East European Studies from the University of Oxford. erica.deffebach@kcl.ac.uk Ms Erica Deffebach is a Research Assistant at Project Alpha with a focus on proliferation risks of new science and technology (S&T) developments. She has recently completed a Masters in International Conflict Studies at Kings College London. Ms Deffebach holds a BSc in Physics from the University of St Andrews with a speciality in Quantum Computing and Cryptography. Hassan Elbahtimy was awarded a PhD from the War Studies Department in 2013 for a thesis that addressed the historical origins of Egypt’s nuclear policy 1955-1968. Since then, Hassan been an active member of Nuclear Proliferation International History Project (NPIHP). In 2014, he joined CSSS as a postdoctoral researcher and was part of a team that ran a collaborative research and training project with Atomic Weapons Establishment, UK (AWE) and Norwegian Institute of Energy Technology. Before joining CSSS, Hassan worked as a senior researcher at VERTIC where his research focused on nuclear verification particularly IAEA safeguards and nuclear disarmament. While at VERTIC, Hassan participated in the UK Norway Initiative on Verifying Warhead Dismantlement as an observer in 2008-2009. In 2006, he was awarded the United Nations Disarmament Fellowship and was a Chevening scholar in 2007.
christopher.hobbs@kcl.ac.uk Christopher Hobbs is Reader in Science and Security in the Department of War Studies and Co-Director of the Centre for Science and Security Studies (CSSS). He holds a Ph.D in physics from the University of London and a MPhys from Oxford University. Before taking up a lectureship at King’s he worked as a Research Fellow funded the Leverhulme (2010-2012) and MacArthur (2012-2014) Foundations. Chris’s work on non-proliferation issues has been largely focused on understanding Iran’s nuclear behaviour and the regional reaction to its programme, which he explores in a co-authored book. In terms of preventing nuclear terrorism he has sought to explore key issue areas including regime cohesion, sensitive nuclear information and risk assessment. His other publications and research interests include OSINT, nuclear detection in the maritime environment, insider threats and security culture. He haa also sought to engage industry, regulatory bodies and governments in nuclear security in order to strengthening both policy and practice. His research and practitioner engagement has been funded by the Leverhulme Foundation, the MacArthur Foundation, the Partnership for Nuclear Security, the European Defence Agency and the UK’s Department of Business Energy and Industrial Strategy. zenobia.homan@kcl.ac.uk Zenobia joined the Centre for Science & Security Studies in January 2018. She contributes to coordinating the Centre’s international professional development courses on nuclear and radiological security, and she is currently working on research relating to security culture, preventative measures against insider threats, and CBRN terrorism. Zenobia is a member of the International Nuclear Security Education Network (INSEN) as well as Women in International Security (WIIS) UK. hannah.kershaw@kcl.ac.uk Before joining the centre, Hannah studied for her MA in Postcolonial Literature and Culture and her PhD in Politics and Literature at the University of York. Hannah is responsible for the administration of CSSS and supports the smooth running of the Centre’s operations, finances, recruitment, and communications. Hannah also assists with the coordination of the Centre’s many research and consultancy grants, and manages the Centre’s prestigious MacArthur Foundation Grant in nuclear security. In addition, she co-ordinates all logistical aspects of the programme of professional development courses around the globe, including maintaining an effective working relationship with the Centre’s many global stakeholders. ben.kienzle@kcl.ac.uk Dr Kienzle is a Senior Lecturer in Defence Studies and an Associate Researcher at the Centre for Science & Security Studies (CSSS) at King’s College London. He is also a member of the Observatory of European Foreign Policy, an international research group based in Barcelona. His current research focuses on multilateral security cooperation, in particular in Europe. Dr Kienzle has published articles in this area in a number of international peer-reviewed journals such as International Affairs, Cooperation and Conflict, Mediterranean Politics and the Journal of World Trade. He is also a contributor to a number of handbooks and edited volumes in both English and Spanish about European security policies. Previously, he was the Marie Curie Fellow at CSSS, where he implemented his EU-NONPROLIF project, a two-year, research-only fellowship project funded by the 7th Framework Programme of the European Commission. Before joining King’s College, Dr Kienzle was a postdoctoral researcher at the Institut Barcelona d’Estudis Internacionals, where he coordinated the DYNAMUS project financed by the Spanish Ministry of Science and Innovation. Dr Filippa Lentzos is a Senior Research Fellow, with a joint appointment in the Department of Global Health & Social Medicine and the Department of War Studies. Her research explores biological threats and the security and governance of emerging technologies in the life sciences. Much of her work is focused on synthetic biology, often identified as the area of the life sciences most susceptible to misuse, but she also examines other emerging fields like genome editing, potentially pandemic pathogens and neurobiology. Her efforts to minimise biological threats involve regular engagement with scientists, governments and the United Nations. She is a member of the BioS research group. Dr Lentzos’ Biological Threats in the 21st Century was published by Imperial College Press in 2016, and became available in paperback in 2017. · Global health security & public health emergencies of international concern. nicola.leveringhaus@kcl.ac.uk In September 2016 Dr Leveringhaus joined the Department as a Lecturer in War Studies. She specialises in the International Relations of Asia, with a focus on China and the security of that region as it relates to nuclear weapons. She is affiliated to the Asian Security & Warfare Research Group and the Centre for Science and Security Studies and the Centre for Grand Strategy in the Department of War Studies. She holds degrees from the University of Aberystwyth (BScEcon (Hons) International Politics and Strategic Studies), the London School of Economics and Political Science (MSc International Relations), and the University of Oxford (MPhil Modern Chinese Studies and DPhil International Relations, both St. Antony’s College). Immediately prior to her appointment at King’s, from 2015-16, she was a Lecturer in International Politics in the Department of Politics at the University of Sheffield. Before Sheffield, Dr Leveringhaus spent several years at the University of Oxford, where she completed her doctoral thesis under the supervision of Professor Rosemary Foot, and conducted early career research. Mr Daniel Liu has been a Sanctions and Illicit Trade Associate with Project Alpha since Sept 2017. Mr Liu was a senior policy officer and an analyst in the public sector, where he supported strategic policy formulation, humanitarian operations planning, international engagement and military exercises. susan.b.martin@kcl.ac.uk Dr Martin is a senior lecturer in the Department and co-Deputy Director of the Centre for Science and Security Studies. Her research focuses on the continuing relevance of structural realism, and in particular the ability of structural realism to contribute to an explanation of the role of chemical, biological and nuclear weapons in international politics. Currently she is conducting a comparative analysis of the use and non-use of chemical, biological and nuclear weapons in the Vietnam War. Other projects include an analysis of chemical weapons use in Syria as well a gender analysis of nuclear weapons and deterrence. Dr McDonald is a Lecturer in War Studies at the Department of War Studies, King’s College London. He is also part of the Centre for Science and Security Studies, and previously convened the Centre’s MA in Science and Security. He holds a PhD in War Studies from King’s College London, as well as an MA in International Peace & Security. Prior to taking up a lectureship at King’s he worked as a contractor for the United Nations Mine Action Service, and prior to that as a Teaching & Research Fellow in the Department, and as a Research Associate on an ESRC grant examining novel technology, law, and warfare. Dr McDonald’s research examines the relationship between the law and ethics of war, and novel technology. He takes an interdisciplinary approach to the study of war and warfare, but he is primarily interested in the philosophical questions underlying the regulation of warfare both in the present and the past. His current research examines the development of technology, military practice, and ethics, as a historically-grounded perspective on the current debate over the legality and ethics of autonomous weapon systems. This is part of a wider research project on power and political violence in digital societies, and the role of tradition in Anglo-American warfare. matthew.moran@kcl.ac.uk Dr Moran is a Reader in International Security and Co-Director of the Centre for Science and Security Studies (CSSS) in the Department of War Studies. He studied for a BA (Hons) and MA at the National University of Ireland, Galway and holds a PhD from University College London. hannah.mulvey@kcl.ac.uk Hannah joined King’s College London in September 2017 as an Administrator in the Centre for Science and Security Studies (CSSS). Hannah coordinates the communications and logistics of international workshops held in London and abroad, with the aim of building an international nuclear and radiological security culture. She regularly communicates with external partners to ensure these events run smoothly. Before joining the centre, Hannah worked in the hospitality industry in the United States with a focus on events management. Prior to that, she was an administrator to the Design, Architect and Built Environment Faculty at the University of Technology, Sydney. Hannah Mulvey holds a BA in History from Central Connecticut State University. Daniel Salisbury is a Research Fellow at the Centre for Science and Security Studies (CSSS) within the Department of War Studies. Daniel joined CSSS in July 2018 from the Harvard Kennedy School’s Belfer Center for Science and International Affairs where he was a Stanton Nuclear Security Postdoctoral Fellow. Previously he was a Postdoctoral Fellow at the James Martin Center for Nonproliferation Studies (CNS) at the Middlebury Institute of International Studies at Monterey, a Research Associate at CSSS, and a Research Assistant at the International Institute for Strategic Studies (IISS). emma.l.scott@kcl.ac.uk Emma Scott is a Research Assistant at Project Alpha. Before joining Project Alpha, she worked as a Research Assistant with the International Institute for Strategic Studies. She also conducted a series of research projects for Transparency International’s Defense and Security program. She holds two MA Degrees, one in Geopolitics, and a joint MA in Humanitarian Action. She also holds two post-graduate certificates, one in Geopolitics, and one in International Relations and Conflict Analysis. She completed her BA in Politics with Law. Her work has appeared in numerous outlets including Europe’s World, Lobelog Foreign Policy, World Politics Review, the China Brief, with the Middle East Institute in Washington, and in the UK PONI Nuclear Reactions blog, amongst others. ian.stewart@kcl.ac.uk Ian J. Stewart is a Senior Researcher in the Department of War Studies at King’s College London where he heads Project Alpha. He is also the training advisor for the consortium implementing the European Union’s Partner-2-Partner program on dual-use goods. He is a specialist on issues related to export controls, sanctions, and non-proliferation more generally. Ian, an engineer by training, has many years of experience in government and working with companies and international organisations in relation to non-proliferation matters. He was also a research fellow at Harvard’s Belfer Center for Science and International Affairs. Ian’s principle area of research relates to export controls and illicit trade. His research focuses on implementation and enforcement of export controls as well as evasion of these measures. Secondary research interests relate to open source intelligence and nuclear history. +44 (0)207 848 7996 Dr Sarah Tzinieris is a Research Associate in the Centre for Science and Security Studies (CSSS) at the War Studies Department. Dr Tzinieris’ current research focuses on nuclear non-proliferation, nuclear security, CBRN terrorism and international relations. She is also the Project Coordinator for the Nuclear Security Culture Programme, funded by the UK government’s Department for Business, Energy and Industrial Strategy (BEIS). Dr Tzinieris has recently co-edited a briefing book on the NPT Treaty which was provided to state parties at the 2018 NPT PrepCom. Her other publications have focused on non-proliferation, insider threats, the EU accession process, UK foreign policy, and mining and oil gas projects. She previously worked at the BBC as a strategist and for the European Commission Delegation at the UN as a Security Council Adviser. She is a member of the UK Project on Nuclear Issues. Dr Tzinieris holds a PhD and MPhil in International Relations from Cambridge University. Dr Williams is a Lecturer in the Defence Studies Department at King’s College London and a CSSS Fellow, funded by the MacArthur Foundation grant. Previously she was a MacArthur Postdoctoral Fellow in the Department of War Studies at King’s College London, where she also finished her PhD in 2014. Prior to joining King’s as a postdoc she was a Research Fellow at Chatham House on nuclear weapons policy and worked at the Institute for Defense Analyses in Washington, DC, where she is now an adjunct Research Staff Member. Her current research focuses on US-Russia arms control and the impact of geostrategic shifts, domestic politics, and changes in leadership. Other policy-relevant issues she is exploring include tailoring assurance to NATO members, the status of the Nuclear Non-Proliferation Treaty (NPT) amid increasing pressure for nuclear disarmament, and competing concepts of strategic stability. Given her policy background, she remains active in the nuclear weapons policy community, regularly engage with government, and is particularly interested in outreach and working with other mid- and early-career experts, along with the next generation interested in working on nuclear issues. Her MA is in Security Policy Studies from The George Washington University, and BA is in International Relations and Russian Studies from Boston University.